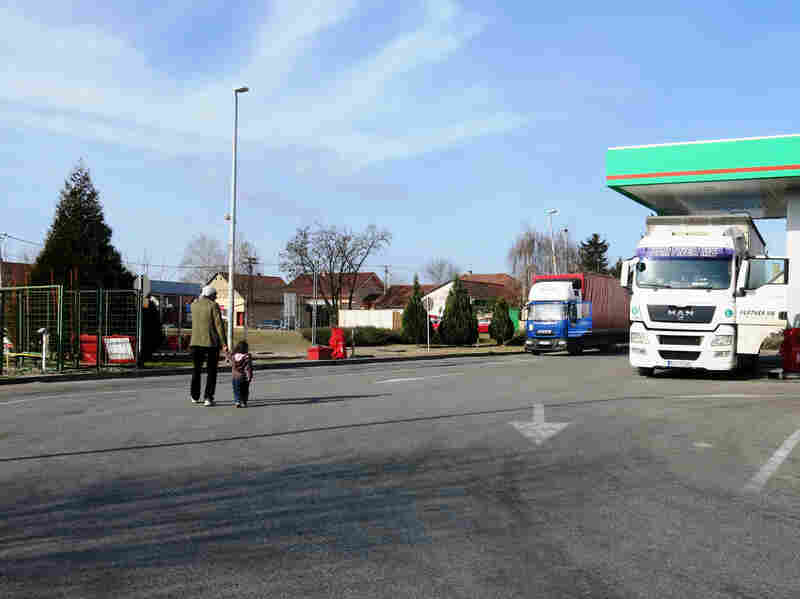 Hungary Reduces Number Of Asylum-Seekers It Will Admit To 2 Per Day : Parallels Hungary has secretly reduced the number of asylum-seekers it will allow into the country to two per day, one at each transit zone. Hungary is the main access to Europe from the Balkan route. Hungarian soldiers enter the transit zone of Tompa border station on April 6, 2017. The migrant transit complex on the Hungarian side of the border has been expanded to become one of two new detention centers for asylum seekers in the Hungarian transit zone and contains shipping containers that are used to automatically detain migrants in the transit zone while their claims are investigated. Hungary has quietly closed its borders to nearly all asylum seekers, which human rights advocates say violates international laws and is stranding thousands of refugee families in Serbia. NPR interviewed asylum seekers, refugee advocates and a lawyer all with direct knowledge of the near closure and the resulting panic and despair. They report that since Jan. 22, Hungary is allowing only one asylum seeker per day to cross from Serbia into each of its two "transit zones." The widely criticized zones – surrounded by barbed wire and dotted with shipping containers configured into living space — are the only places asylum seekers entering Hungary are allowed to go unless they already have refugee status from another EU country. U.N. High Commissioner for Refugees Filippo Grandi last September likened the transit zones to detention centers and called on Hungary to improve access for asylum seekers. Now, access is reduced to two people per day. Critics of Hungarian refugee policy say what the government of Prime Minister Viktor Orban and his ruling Fidesz Party is trying to do is boost approval ratings before parliamentary elections on April 8. They've adopted an anti-refugee platform that's been shaken by the recent revelation that Hungarian authorities approved twice as many asylum applications in 2017 than the year before. The near closure of the border "is absolutely unbelievable," said Marta Pardavi, co-chair of the Hungarian Helsinki Committee. "This means only unaccompanied minors or single men can get in – no families whatsoever." Afghan asylum seeker and his 2 1/2-year-old daughter. The Hungarian government denies it is imposing any limit, but acknowledged few asylum seekers were entering the country as of late. At a weekly government press conference yesterday in Budapest, Janos Lazar, the head of the Hungarian prime minister's office, said immigration authorities can't help it if asylum seekers don't want to come. "There is no such rule that they can take in one daily," he said. "But if there's [only] one man standing there, why should 10 customs officer[s] sit there?" His claim of few takers is improbable given there are thousands of people trying to get into Hungary at the moment from Serbia. UNHCR last month reported 4,196 new refugees, asylum-seekers in migrants in Serbia, of whom only one in nine are looking to stay there. The NPR team interviewed three Hungary-bound asylum seekers in Serbia Friday alone. One Afghan man who was walking with his 2 ½-year-old daughter to buy milk at a grocery store in Subotica, a 20-minute drive from the Serbian border with Hungary, said he's been waiting for four months at a refugee camp funded by Germany and that used to be a dog shelter. "All of us here are in despair. We are ready to scream, we are so upset. Our fates are unclear," he said, asking we not identify him or his family after a Serbian police officer drove up and harassed him for talking to NPR. He, his young daughter and 12-year-old son are trying to reunite with his wife, who is an asylum seeker in Frankfurt and who hasn't seen her children or husband in two years. Fellow camp residents Sheerali Rezaie and his wife, Fatimeh, said they are at their wits' end. Going back to their volatile province of Daykundi in Afghanistan is out of the question and they have no choice but to keep trying to get to Hungary, he said. The couple, who were taking their daily walk outside the compound, are also trying to get to Germany with their two sons. Their eldest son is 23 and living in Munich, where he's applied for asylum, they said. "This camp is hell," Sheerali Rezaie said. "The food is bad and there's nothing for us here." He said now that only two people are being allowed into Hungary, "Everyone is afraid. We worry they'll close the gates forever and say, 'good-bye, take off.' 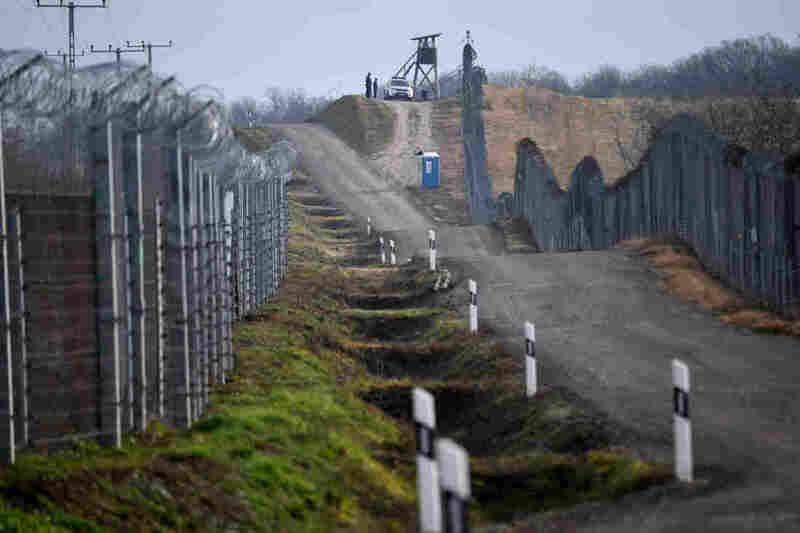 "
Border soldiers patrol along the border fence at the Hungarian-Serbian border near Hercegszanto border station on December 14, 2017. 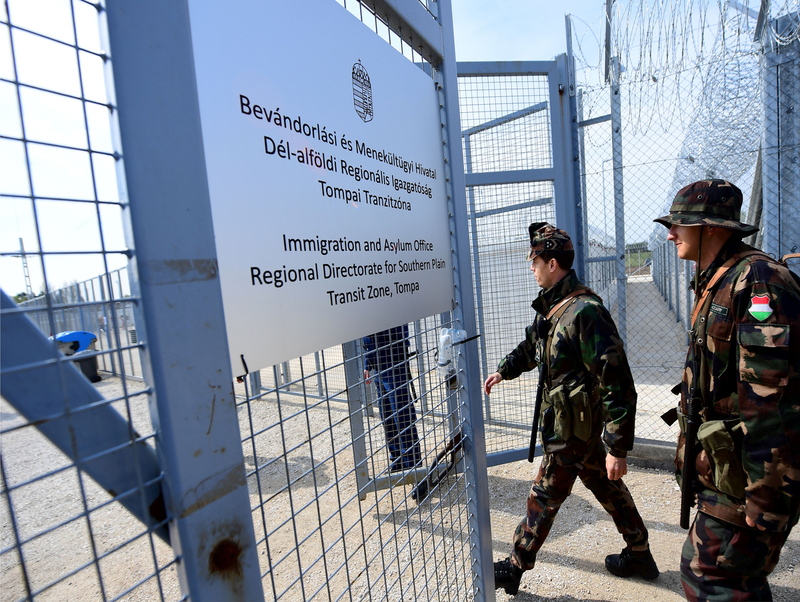 Since July 2015 Hungary secured the more than 300-km-long border to Serbia with the construction of a fence and 24 hours a day security patrol tasks. Timea Kovacs, a Hungarian lawyer who represents refugees in the transit zones, said she's been bombarded with text messages and emails from asylum seekers stranded in Serbia since the near closure began. They "are very worried," especially the families, she said. "Some of them were waiting there for more than one year." She and the refugee advocates say the decline in the number of asylum seekers allowed into Hungary has been gradual since Budapest built its first fence in September 2015 to stem the flow of migrants crossing its formerly open border with Serbia. Since then, the fence has been reinforced multiple times. It is a daunting barrier, outfitted with barbed wire, heat sensors, video cameras, and armed police patrols that quickly detect any attempted breech. Kovacs says most asylum seekers now appear to accept the only way in is to enter the two transit zone camps outside the Hungarian border towns of Tompa and Roezske. But those opportunities are dwindling. In 2016, 60 asylum seekers total were allowed to enter each day into the Hungarian transit zones; then it was reduced to 30. Last year it was 10, and now it's two.